My tomato jungle this year. It’s that time again, isn’t it? Time to start planning for next year’s garden. The kids and I spent a couple of sunny afternoons this week tearing down tomato cages and burning tomato vines (little Mack: “So I can start the fire? Boy, I like gardening!”) so Bryan could pull out the little Ford tractor and plow up the soil so it can soak up the rain and eventually the snow that will (it will, won’t it–it has to rain and snow eventually, right?) fall. I stared at that journal entry, frustrated at myself. I had forgotten, despite my best intentions. At precisely the moment that the garden was restored to its blank-slate condition. Tabula rasa garden. The gardens were plowed under, there were rows of bright and cheery canned goods in the pantry, buckets of potatoes and squash and garlic and onions were stored away for winter use, and I was feeling productive and content. And I started planning my next year’s garden. My garden wants to teach me something, I’m sure of it (at the risk of sounding too new-age). I take note of the lessons when I’m in the trenches of gardening season, so to speak, but then I forget them so quickly. This year I am determined to remember my mistakes, so I can learn from them, doggonit! Perhaps by sharing them with you, I’ll not forget. Maybe. Hopefully. So without any further ado, these are the top six lessons my garden taught me this year. 1. Pay Attention to Space Requirements. This is one that I ignore all the time, to my embarrassment and shame. The result? The melons are hard to find in the crowded melon patch, it’s frustrating to pick tomatoes (see picture above) and harvesting and weeding and all other garden chores are just not as satisfying. You know how you feel when you walk into your garden or your yard and it’s lovely to look at because you’ve done your work, your pruning and planting and what-not, and you are now reaping the benefits? You know that flush of pleasure, visually-speaking? I felt just the opposite when I went into my garden this summer, because of the crowding. Kind of a depressed spirit, an Amy-you-doofus-what-did-you-do? feeling. You know the one. I’m greedy, you know. I want as many melons as are humanly possible to get out of my allotted melon area. So I crowd them. And this backfires on me. Wouldn’t you want as many of these melons as possible? 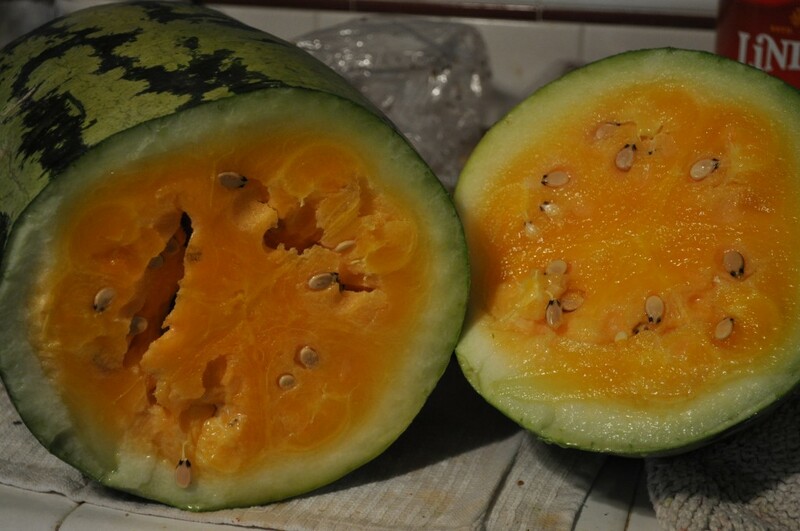 This is an Orange-Glo variety from Baker Creek Heirloom Seeds and it was one of the tastiest watermelons I’ve ever eaten. So if the seed envelope says to allow six feet between melon hills, allow six feet between melon hills! 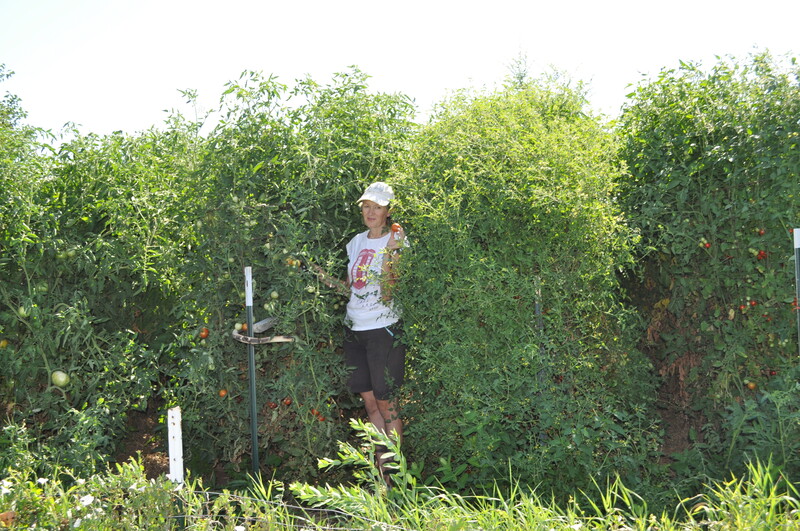 And if you just know that your tomato plants get freakishly large (from past experience) for reasons unknown to you, allow more space than is recommended. DO NOT stubbornly plant them as closely together as possible, reckoning that it will work out just fine. Those plants will get big! Shoot, next year I want to be able to pick tomatoes from my plants without crawling, scooting, and shimmying! Enough of that. 2. Don’t skimp on mulch. Just don’t. I was tight on cash this spring, so I didn’t buy as much mulch as I usually do. It was a false economy, my friends, a false economy that I ruefully regretted when several of the unmulched beds sprouted up into weediness early on, which resulted in loss of time, loss of veggies, loss of that all-important garden pride. I usually buy a trailer load of straw and spread it liberally around my plants, on the paths, in the rows. It holds the moisture in the soil, it helps keep the dreaded villainous weeds from breaking through, and it looks pretty. My skimping on mulch resulted in my abandoning many beds just because they became so weedy and I couldn’t keep up. 3. If you put down drip irrigation or soaker hoses, test them all out before you put them under black plastic, mulch, or the edges of tomato cages, do. Or among the pepper supports. Especially if you use second-hand hoses (as I do) and oft-repaired hoses (as I do) which are more liable to spring a leak. Why? Isn’t this a time-kill? Because, Gentle Reader(s), once you have the soaker hoses hidden so efficiently under mulch and tomato cages and you turn them on when you hit that first dry patch in the weather, it will be nearly impossible to find the place(s) where the hoses are sprouting leaks. And they will sprout leaks. They will. You will huff and puff, but there will be no de-constructing the beautiful job you did of covering those hoses up now to fix them, so you will abandon them (secretly) and then you will find yourself watering your favorite plants by hand for the rest of the long, hot, dry summer when you find yourself in the middle of a historic drought. You’ll sadly watch the plants that you don’t have time to water wither and die, ineffectual watering system buried underneath them. Snif. And you will wish that somebody, somewhere, would have hinted that you test those hoses . . . and that you would have listened. Silly you. 4. A savvy gardener will do a few things in the fall to prepare for the spring. Spring is always just crazy around here. We are finishing up our drama project for the year in March, a melodrama put on with a homeschooled group of kids, and we have a million things going on outside: usually a few trees to plant, and winter branches to clean up, etc., not to mention all the early spring garden planting. Lots of dancing for joy, since the winter, at that point, has bruised and battered us but has not killed us. It is a euphoric time, and there isn’t always time to mend fences or buy mulch or make a few more tomato cages, or plan garden layouts or take seed inventories and order seeds. Those are things I plan to do this fall before the snow flies. Because I am a savvy gardener. Or, at least, I intend to be one. 5. Prepare for the worst, or at the very least, spend a bit of time imagining it. When I planted the Most Ambitious Garden Ever this year, during an unseasonably warm early spring, I had no idea, of course, that it was going to stop raining in June, and that we were going to sweat through the hottest summer ever recorded. Now that we lived through that, I will always (I will not forget) try to keep in the back of my mind a Drought Preparedness Plan, so to speak, just in case. What would this Plan look like? Hoses and soaker hoses repaired and set up, plenty of extra mulch on hand, manure thickly spread in the early spring, and every other defense against a rough gardening year firmly in place. Just in case. 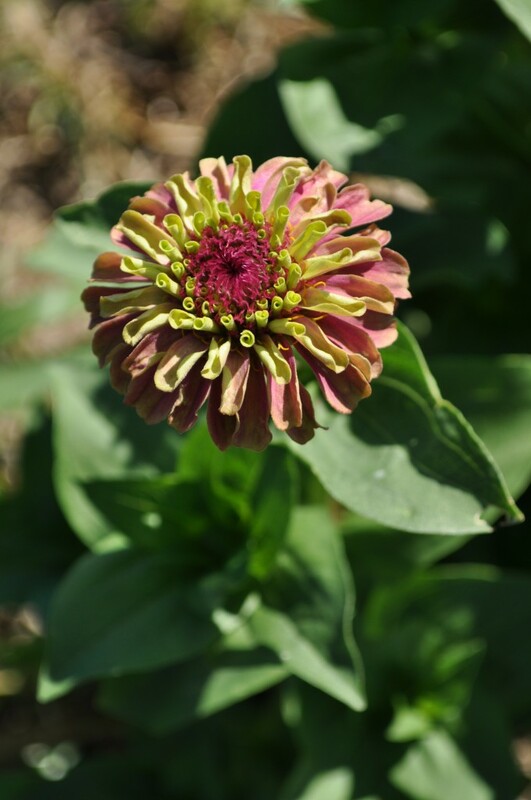 This new variety of zinnia, Queen Lime, is one of my favorite zinnias ever. This is good advice for life, not just for gardening. Having perfectionist tendencies, I tend to beat myself up over the failures: the enormous bed of fennel bulbs that I let go to seed (oh, the humanity! ), the huge squash bed that succumbed to weeds and squash bugs, the heirloom corn that took forever to produce ears, and only a few at that (better luck next year!) instead of rejoicing over the bushels and bushels of beautiful tomatoes, and peppers, and melons, and kale, and potatoes, and shallots . . . oh, you get the idea. There’s always plenty of good to enjoy, even amidst the bad, and that’s what you should let your gaze fall upon. There are times, Gentle Weeders Readers, when weeds in the garden, as in life, must just be ignored. So happy garden-planning, friends, as that is where we find ourselves this November. Planning, hoping, and delighting in visions of next year’s gardens. And hey, if you have any lessons learned, any garden insights that you’d like to share with me from your garden this year, please leave a note in the “Comments” section. I always love to hear from you. Oh dear. This hits a bit too close to my heart, dear Amy. I was informed three weeks ago by my dear sweet husband that I could not plant as many tomato plants next year. He likes the idea of planting fewer and taking better care of them. Go figure. I immediately started grieving the varieties that I would have to let go of. Will I even be able to look through the Baker Creek seed catalog? Will I have enough self control? I could probably act pitiful enough that my ‘tough’ husband would cave in. But what if he’s right? Oh Anne. That catalog. I love it, and I hate it. I WAY over-ordered seeds this year, because of that catalog. I ordered enough seeds to plant our entire 8 acres in tomatoes, alone. Nearly. So I feel your pain. Hey, Bryan ran over a few of my tomato cages, just to discourage me from planting so many ‘maters. So it appears that we are in the same boat. Take a little time now to prepare a tiny corner of the garden, maybe 3 feet by 6 feet in which to plant radishes and lettuce, maybe spinach, next FEBRUARY. When it works, it is wonderful. Double or triple the area needed as stated on the seed packet for vine crops. I use a hoe-length to space my tomatoes, works pretty well. And… the Zucchini is the Sorcerer’s Apprentice of the garden.